The screenshot above shows the DOM panel for a page that implements myFunction function. If you right click on the function (the link on the right side) you'll see context menu with Log Calls to "myFunction" option. Check it, switch to the Console panel and operate the page to execute the function. You can see the log on the screenshot, it's the function name. If you click it you'll be navigated to the Script panel to see the source code. The logging can be also activated from the Console panel. Yet another way how to activate the logging is using the Watch side panel in the Script panel. If a reference to myFunction function is available in the Watch panel you can right click on its value (the green text) and again use the context menu. 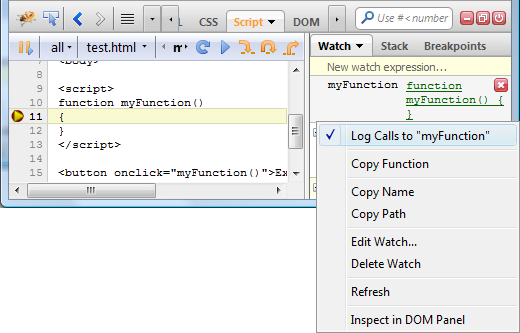 You can also use Firebug Command Line to activate function calls logging. There are two related commands. If you execute the following expression in the command line, logging will be activated for myFunction function. Finally, the list of functions, which are being logged to the Console panel is available in the Breakpoints side panel. You can also deactivate logging by clicking the red cross button on the right side. Oh, very useful... yes, patching in calls to console.log is pretty much routine for me, so being able to do it without code changes would be perfect. I see a lot of people which forget to remove their console.log() calls from their prodcution code, therefore this is perfect! parameters and variables are also logged?